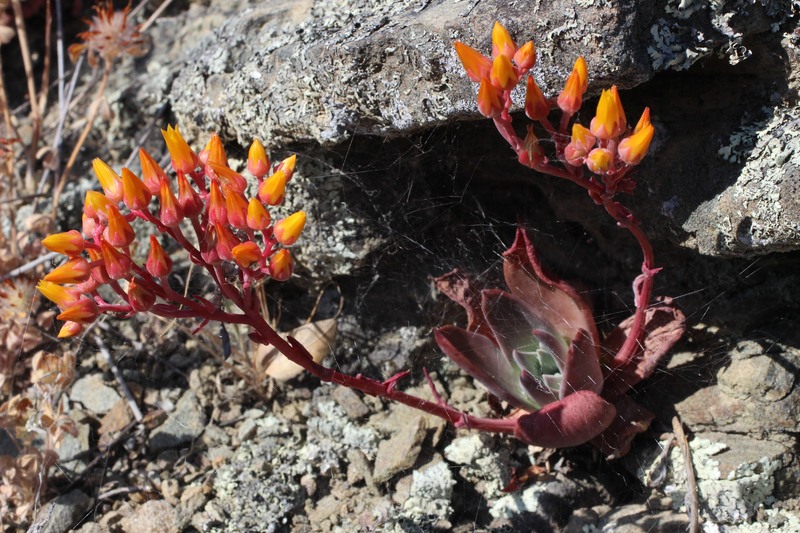 Rock lettuce (Dudleya cymosa) is one of the few native succulents here on the central coast. In the spring and summer the rosettes of fleshy leaves shoot up colorful stalks of flowers. 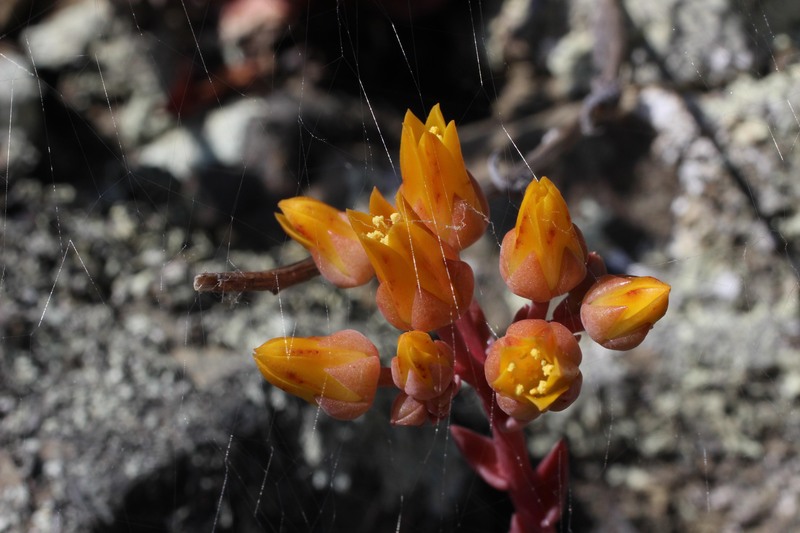 The stalk itself is red, while the many narrow flowers range from orange to yellow. The brilliant blooms are narrow and always appear to be on the verge of opening–but look close and you’ll see six pale pollen-dusted stamens hidden among the flowers’ pointy petals. Rock lettuce can be distinguished from its cousin, sea lettuce, because it tends to grow inland rather than quite close to the coast. It can be seen throughout most of the state, from the Sierras to the coastal counties. 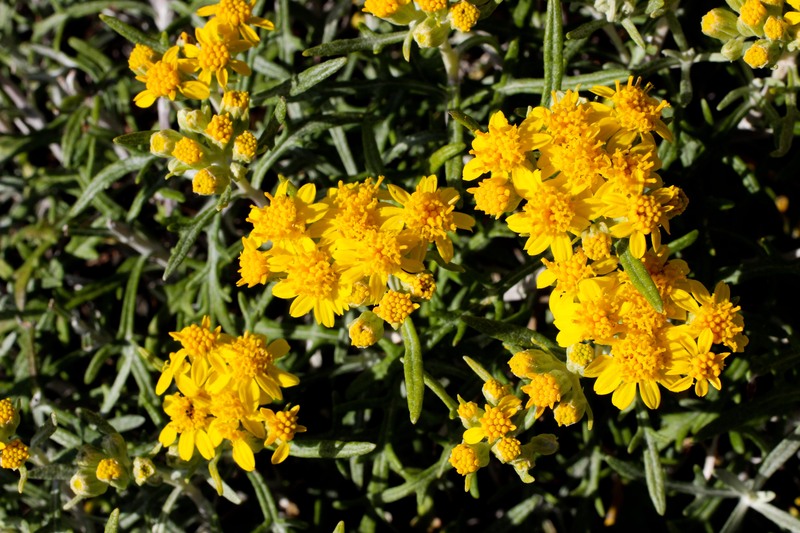 Also even the yellow flowers tend to have a hint of orange in them, while sea lettuce blooms are a chillier, lemony hue. Did you ever have a toy troll as a kid? 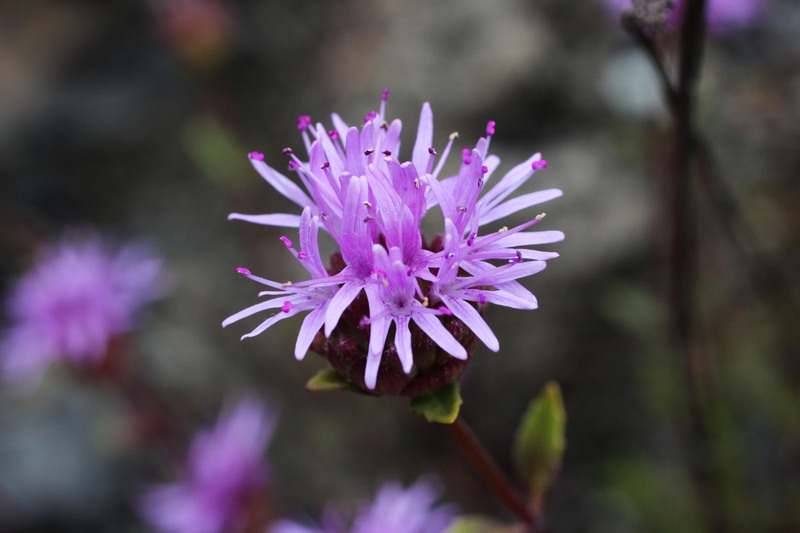 Probably not, but for some reason blooming monardella remind me of those little plastic creatures with a fantastic tuft of colorful hair. If only they came in green, the image would be complete! 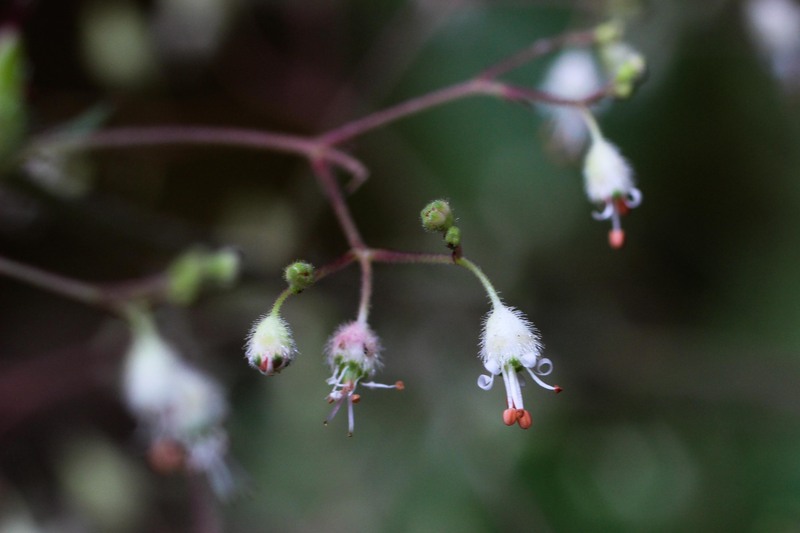 All mondardella species look very much alike at first glance: a crown-like tuft of small purple flowers perches atop a mounded head of buds. The leaves are the easiest way to distinguish serpentine monardella (Monardella purpurea) from its more common cousin, coyote mint. 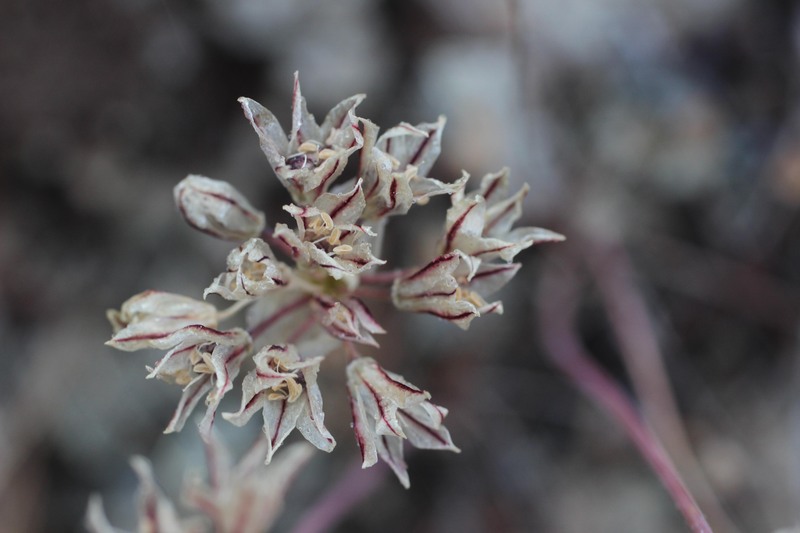 Serpentine monardella has hairless, glossy leaves with shallow veins. The veins of coyote mint are stamped deeply into the flesh of the slightly- to very-hairy leaf, as if by a heavy weight. 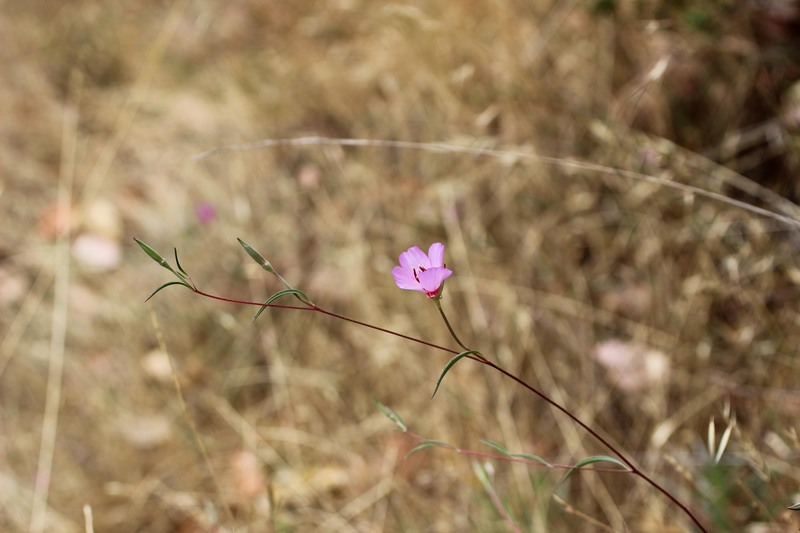 Clarkia are a lovely and varied group of flowers–there are seven different species that are listed for Marin alone. These four-petalled beauties are almost always pink, and often look very similar to one another. They are often generically simply dubbed Clarkia, or Farewell to Spring. 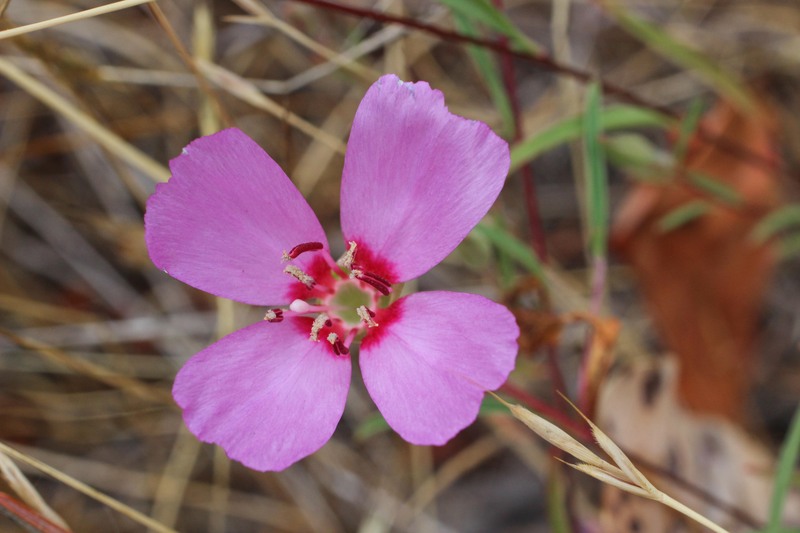 If you look close, reddened Clarkia (Clarkia rubicunda) are distinguished from their cousins by having ordinary petals that aren’t dramatically narrowed. The flowers are either solid pink or have a red splotch at their base (but not elsewhere). 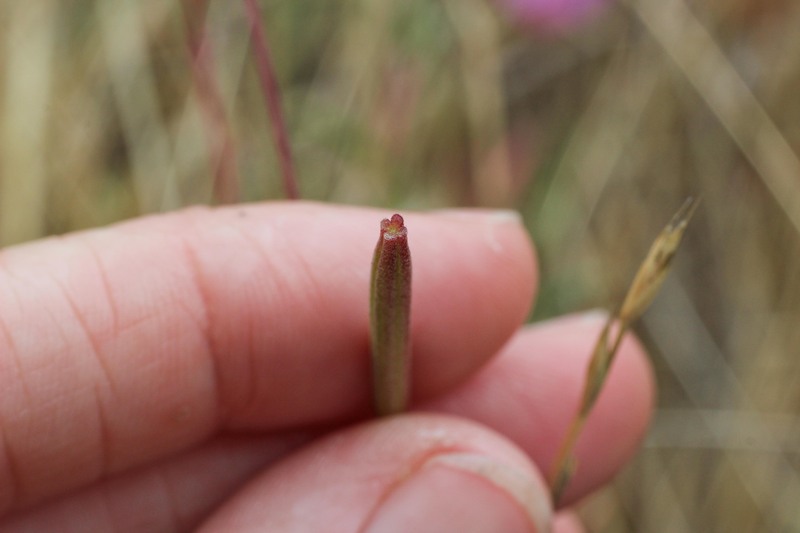 Their unopened buds are erect, not drooping, and the young, long seed pods are notched with four distinct ribs. Luckily, each stalk bears several flowers that open consecutively, so in a patch it is often realistically feasible to find both these diagnostic traits at the same time. 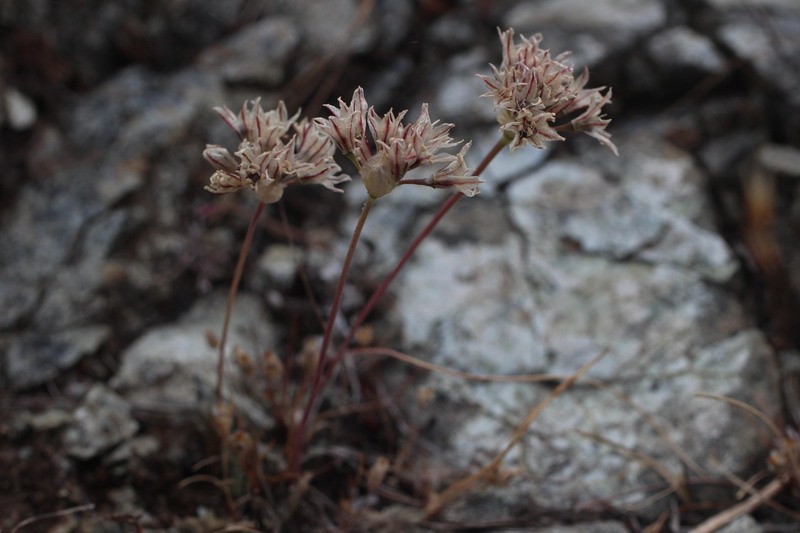 Tall, delicate sprays of tiny white flowers bloom from a shaded crevice of rock. Large scalloped leaves grow abundantly around the base of each stem. 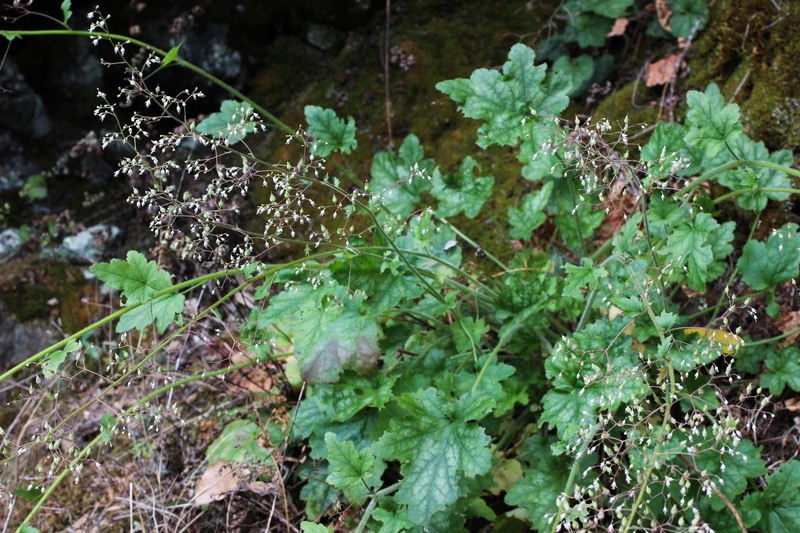 This is alum root (Heuchera micrantha), a member of the saxifrage family that was used for a wide variety of medicines by native Californians. The minute flowers are lovely and intricate, with thin narrow petals that curl backwards around the white sepals like ribbons on a gift. 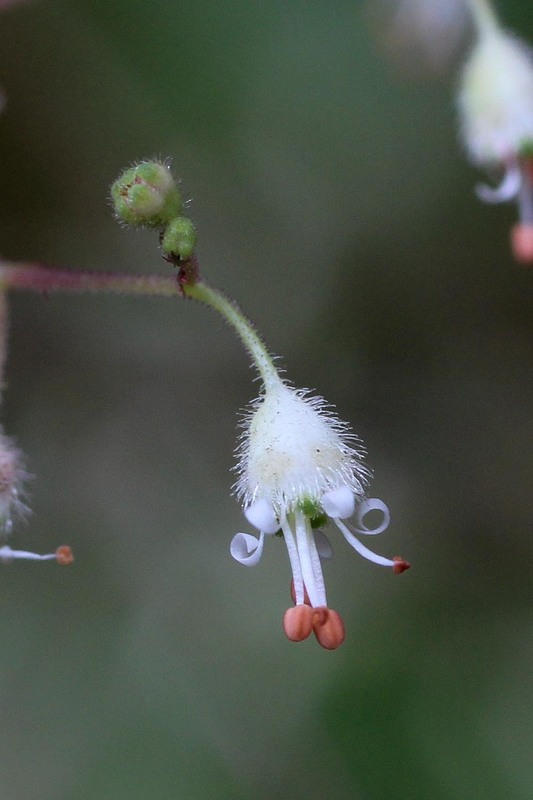 Long white stamens are tipped with rust-red anthers. 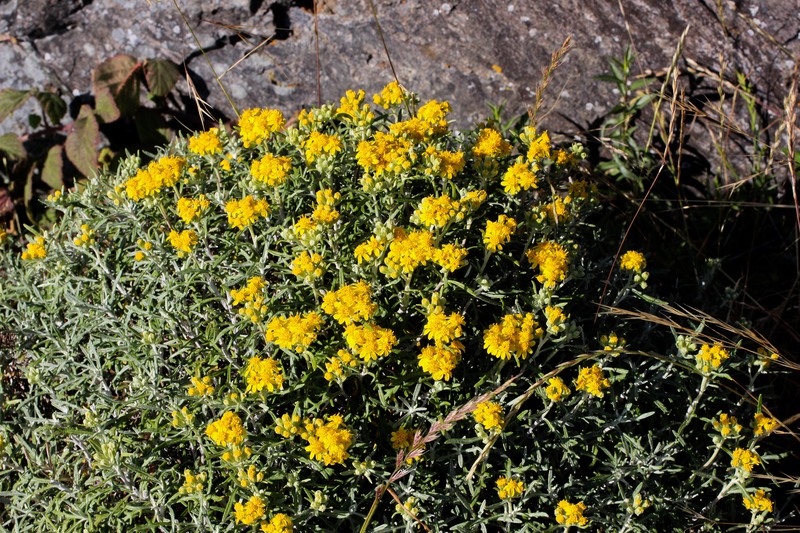 The root of alum root was taken for sore throats, boils and liver troubles. Roots and leaves were chewed up and spat onto the skin, or mixed into a poultice along with Douglas fir sap, as a topical treatment for wounds. Leaves and stems were pounded and rubbed on the scalp to make hair grow, and also eaten for food–either boiled or steamed. I found this poem in a collection by Mary Oliver from the 1970s; a sweet tribute to underground ecology. I particularly love… well, all of it. But the way she builds to the close is excellent. Larkspur is always lovely, with its hood-shaped flowers in vivid colors. 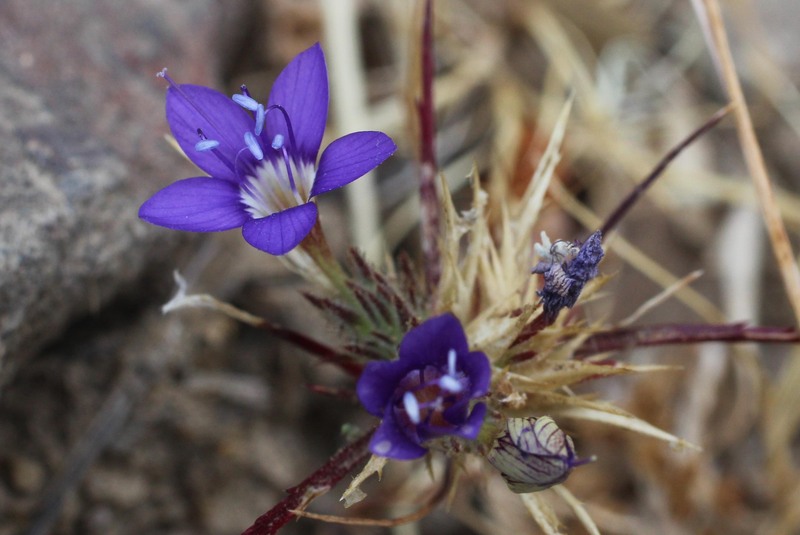 Western larkspur (Delphinium hesperium) has an affinity to dry, serpentine grassland hillsides. 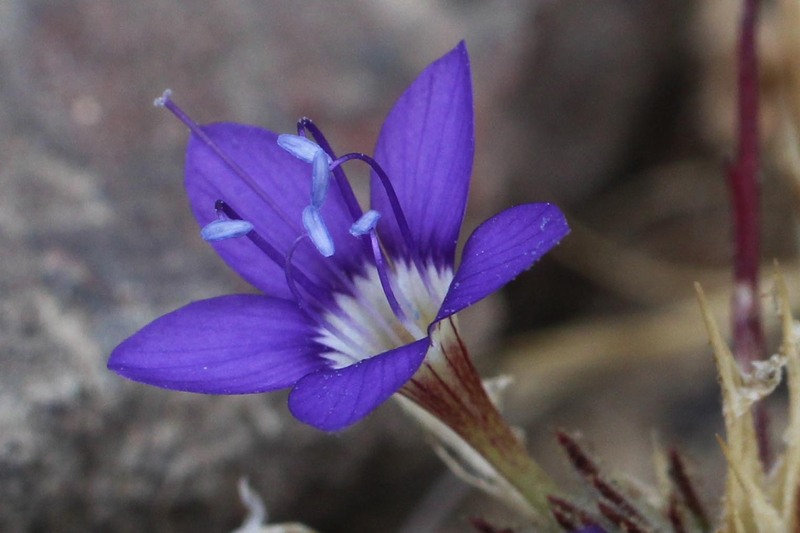 You can recognize this species by its crowded spikes of blue flowers and slightly furred seed-pods. But look close, because there are many other species of blue larkspur in the area!